One of Godzilla‘s biggest surprises was just how little it used one of its biggest stars. For many of us, Godzilla is the first role we’ve seen actor Bryan Cranston in since the end of his brilliant turn as Walter White on AMC’s crime drama Breaking Bad. It’s safe to say that is one hell of a hard act to follow, so we were expecting his Godzilla role to be very unlike Walter, but we didn’t expect it to be so short. As in, “dead by the end of the first act.” As scientist Joe Brody, Cranston spends his brief time on screen determined to prove that the death of his wife during a mysterious calamity at the Japanese nuclear plant where they were working at was no accident, and that the people in charge know far more than they’re letting on. And he’s proven right, in front of his doubting son Ford (Aaron Taylor-Johnson)…just in time to die during the escape rampage of one of the film’s ferocious “M.U.T.O.” creatures. I’ll be honest with you: we tried versions in the screenplay where he survived. And in every one we did that with, there was nothing else that character could do without being silly. If he sticks with Ford, it becomes Indiana Jones and the Last Crusade, and the tone of the movie becomes fun, but not the tone we were trying to do. And if he sticks with the military guys, he’s like a fifth wheel. His job was done in the storyline there. Over the course of the film we watch Godzilla get clobbered by the two M.U.T.O. creatures, but he saves one of his most iconic attacks for the film’s climax. 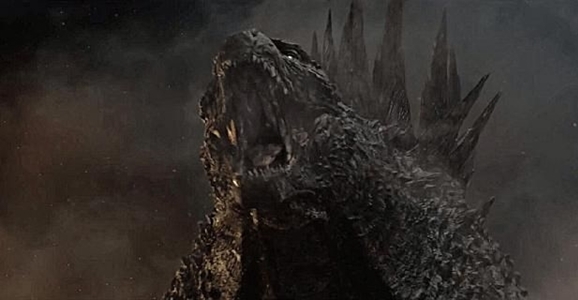 Everybody loves Godzilla’s atomic breath, but it’s the sort of thing that really needs to be used in moderation, especially when you’re going for a semi-realistic tone (well, as realistic as a movie about giant monsters can be). Sure, we’re not technically given any in-story reason why Godzilla couldn’t just bust out the blue flames during the first M.U.T.O. encounter, but the narrative reason is because, after waiting most of the film, holy crap is it satisfying when Godzilla finally does cut loose. The way Edwards stages the first atomic breath moment, the visual build-up to it, made for one of the most satisfying moments I’ve had in a movie in ages. And when he brings it out for the second time, it’s for a coup de grace worthy of the Mortal Kombat franchise. We thought we weren’t going to get away with it. ‘This is absurd,’ we thought. And then we sat and did a test screening and it was everyone’s favourite moment. On the poster, in Japanese — because obviously we all know Japanese — the title of that film is ‘Let Them Fight.’ If you look at the images, they are M.U.T.O.s and a nuclear reactor and the Golden Gate Bridge. The movie is represented on that poster. He came in and gave a pass of the screenplay about two or three months before we started filming. A lot of his work remains in the film, but a big part of it is when the doors close on Juliette Binoche — this whole idea that there’s a gateway or a check point they have to get through, and that it would close, and you would see her die, and we’d have that very emotional moment. That was his biggest contribution. It’s the emotional peak of the film, potentially. That’s why he’s Frank Darabont. I don’t know about you, but I’m getting a little choked up by all of this. Let’s watch some crazy Japanese Pepsi ads with giant monsters to take our minds off it.